One of the “secrets” of Jagat Sharma’s success in Collegetown is that he designs unobtrusive, good-looking projects on a restrained budget. Sharma can probably add 114 Catherine Street to his list of successes. The next few entries are more or less just to clear out my portfolio and keep the blog updated with separate entries to make searches for individual projects easier. If you’ve been reading the Voice, you won’t see anything “new”, but you will get more photos and more information. In these photos from the end of July, the work is nearly complete. 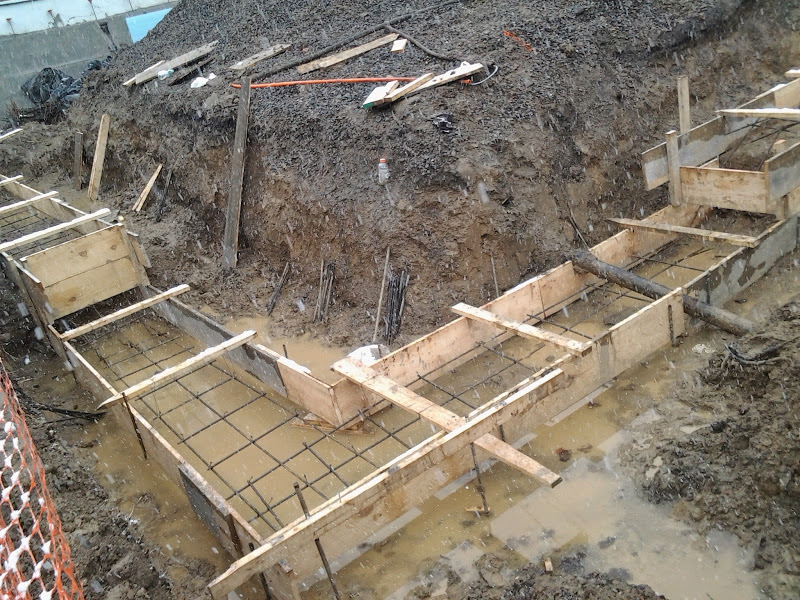 A few workers were assembled around the concrete foundation, where the most visible corner will have an imprinted rectangular pattern for the sake of visual interest. 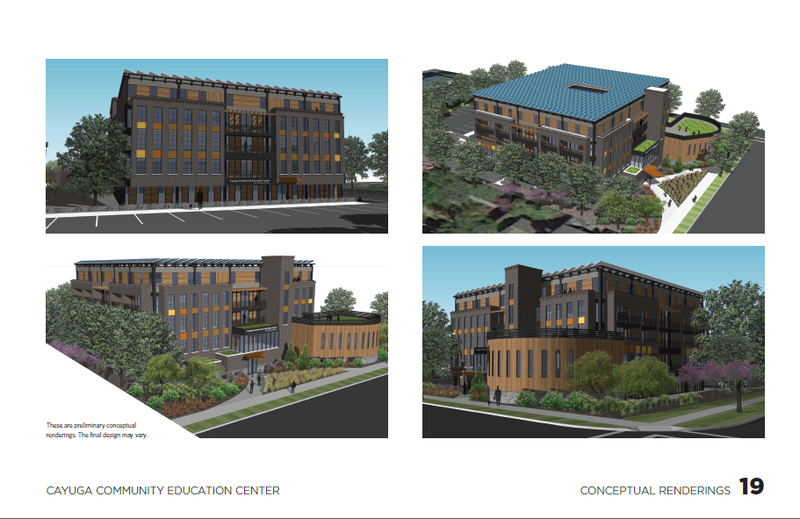 The render I included this post was what I thought the version of 114 Catherine that was going to be built, but the corner windows aren’t as big, and the A/C units appear to be missing from the southward (front-facing) windows, and were moved to the side instead. Workers are also busy with finishing out the interior, and the front door and stairs will be installed once it’s convenient. 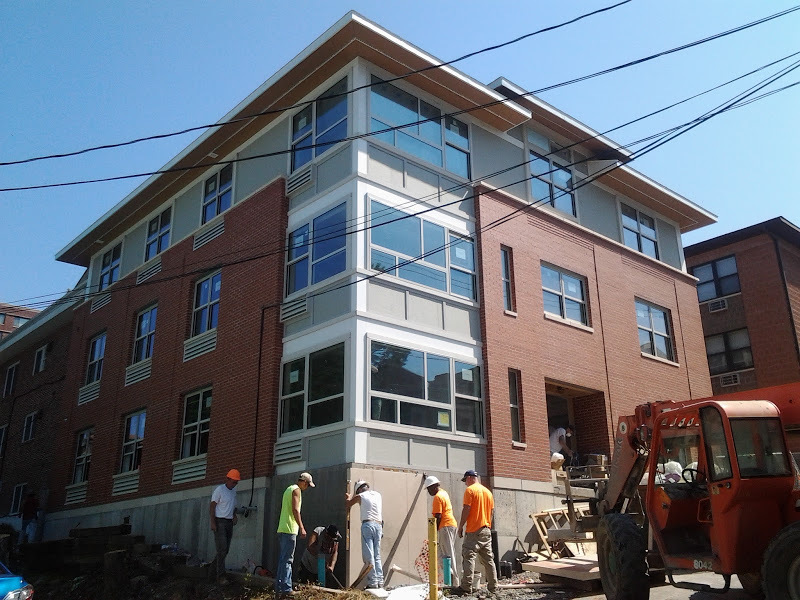 Landscaping will follow, and from there it’ll be ready for tenant occupancy later this month. 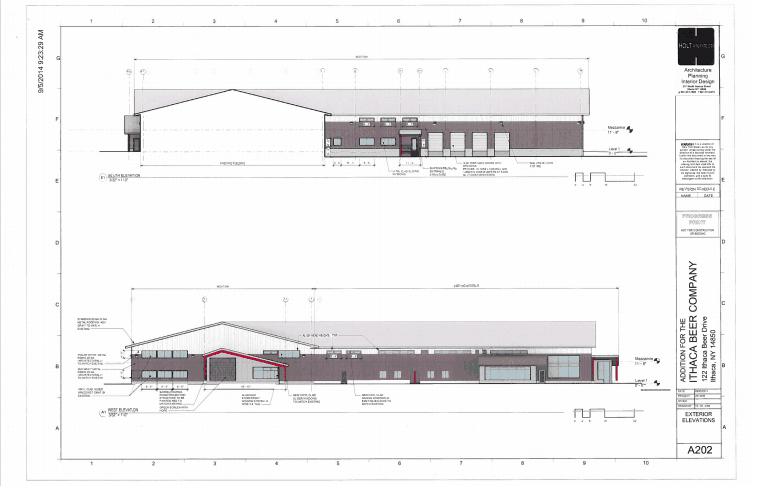 The building is being developed by Nick Lambrou of Lambrou Real Estate. 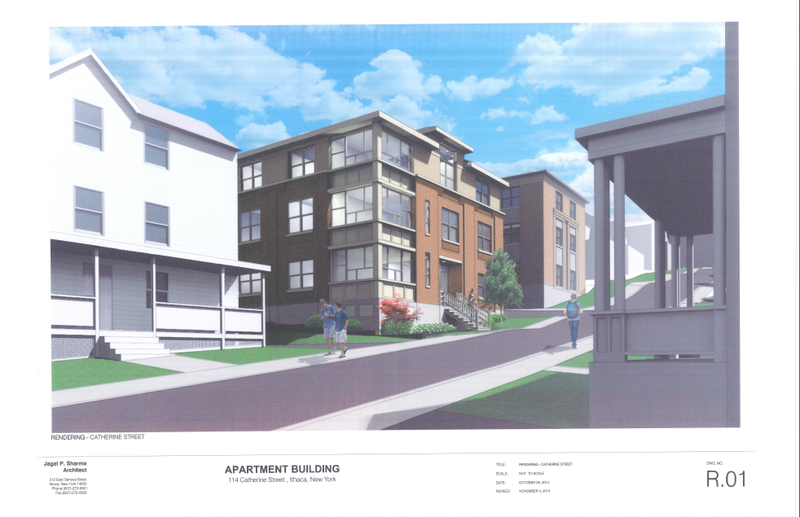 Plans call for a 3-story, 4,180 sq ft structure with a 5-bedroom apartment on the first floor and a 6-bedroom apartment on the second floor and on the third floor. The building replaces a surface parking lot. 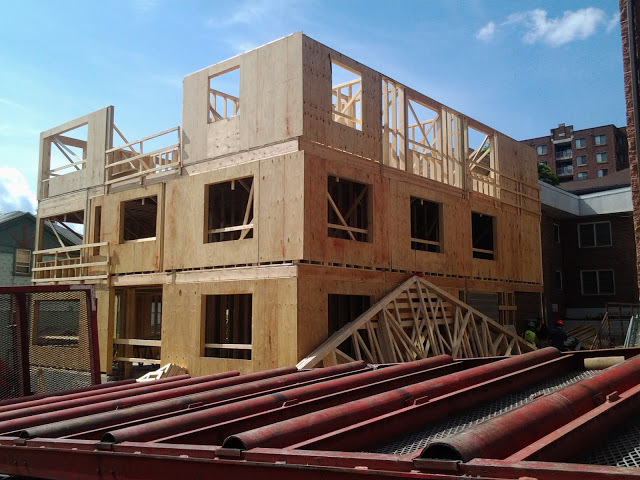 Workers have been busy at the site of 114 Catherine Street in Collegetown. 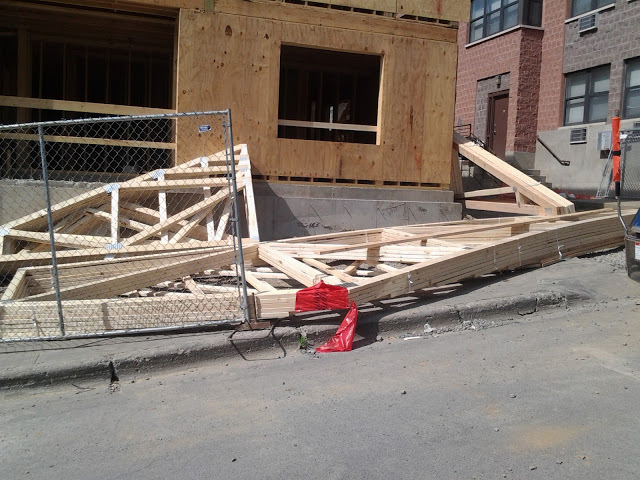 On Friday, a flatbed truck was parked just off-site, delivering the roof gables for the 3-story, 17-bedroom apartment building. 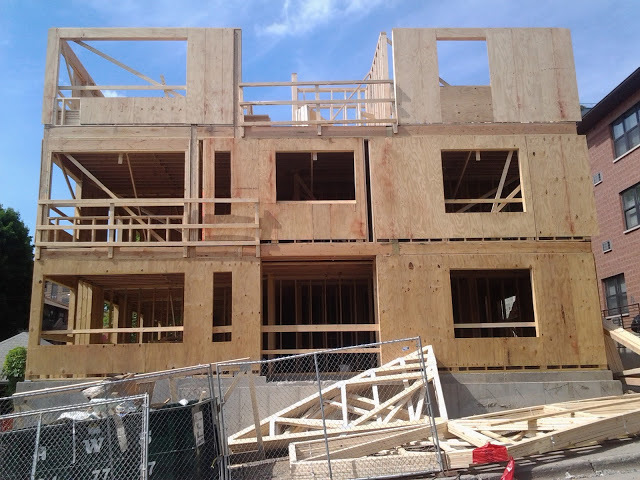 Framing for the structure is actively underway, with recently-created rough openings showing the position of the windows and doors in the new 3-unit structure. The architect behind this project is local architectural firm Jagat Sharma, and he building is being developed by Ithacan Nick Lambrou of Lambrou Real Estate. 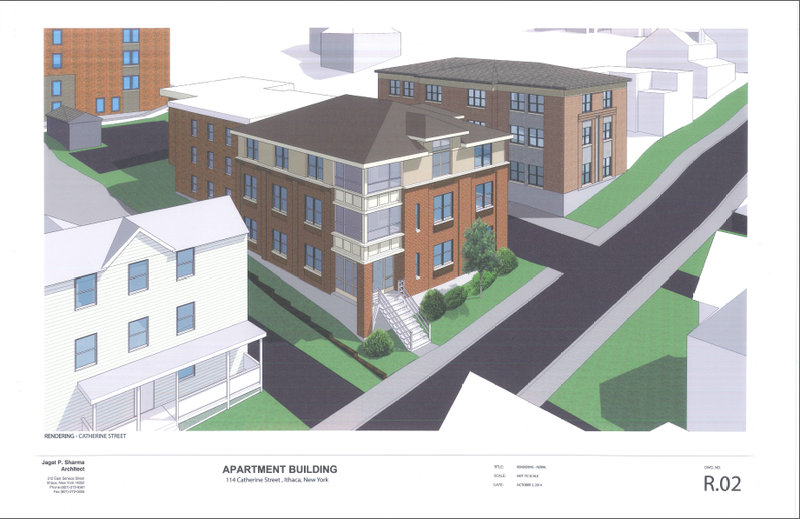 Plans call for the replacement of a parking lot with a 3-story, 4,180 sq ft structure with a 5-bedroom apartment on the first floor and a 6-bedroom apartment on the second floor and on the third floor. Building loan documents filed with the county establish the construction costs to be $1.3 million. 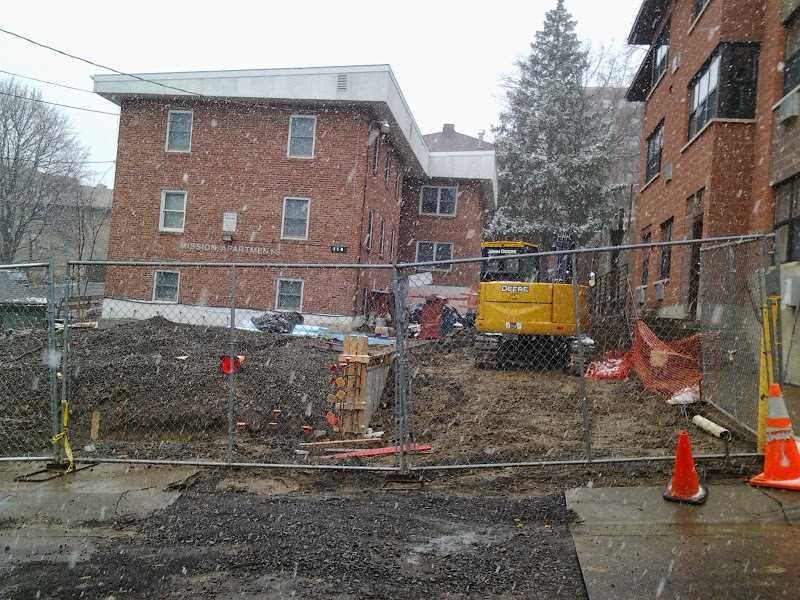 If construction stays to schedule, the building should be completed in time for Cornell’s fall semester. 1. 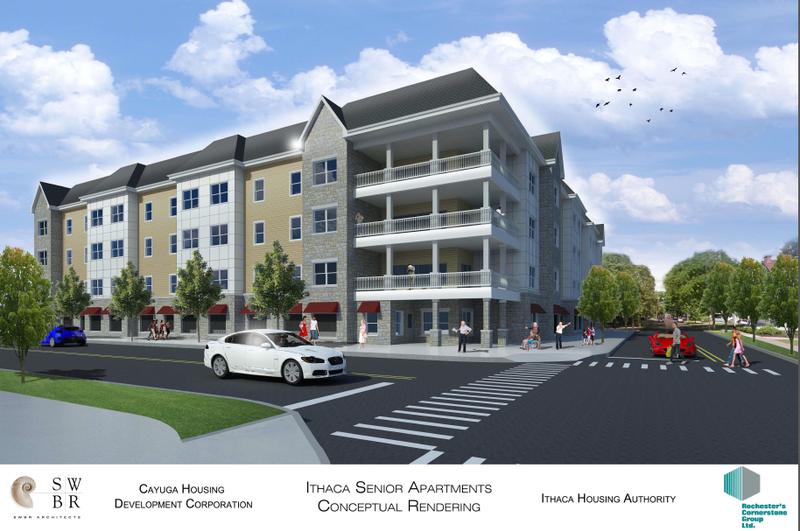 Not exactly a development, but this will make things interesting: As reported by the Ithaca Journal, INHS and Better Housing for Tompkins County (BHTC) are merging. 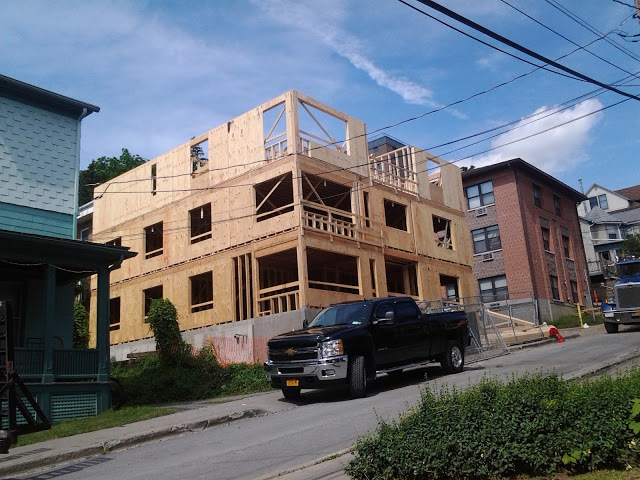 Both of them have the same purpose, which is to provide low-to-middle income housing and structural rehab services, but INHS has traditionally focused in Ithaca city, and Better Housing in the rural towns. INHS also holds far greater assets, $24 million including 241 rental units , vs. BHTC’s $3 million and 121 rental units. Over the past few years, INHS has put a lot of feathers in their cap. $2.13 million in grants has been awarded to the non-profit in just the past few months. Breckenridge Place and Holly Creek are complete and nearly complete respectively (total 74 units), while Stone Quarry and Greenways are prepping for site clearing and construction (total 81 units). 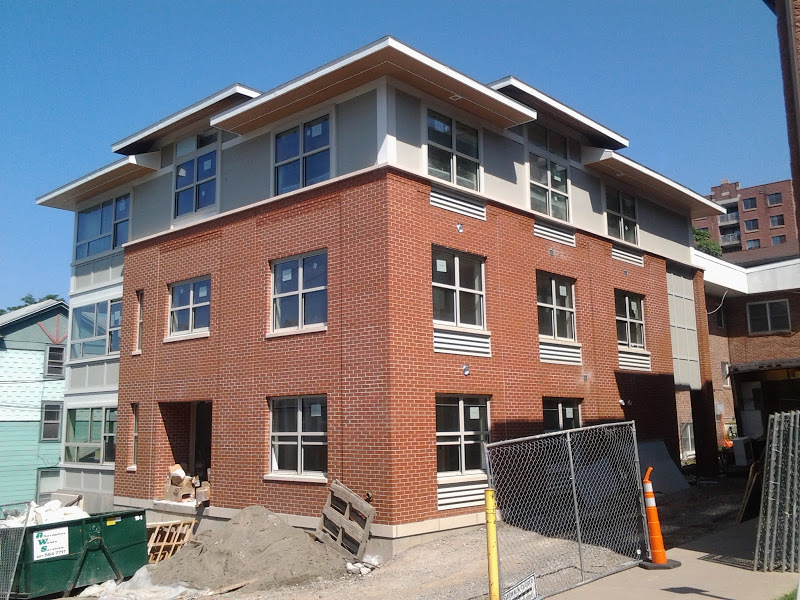 Along with Cedar Creek and several single-family and duplex units, INHS has had a hand in over 120 units of housing in the past five years alone. 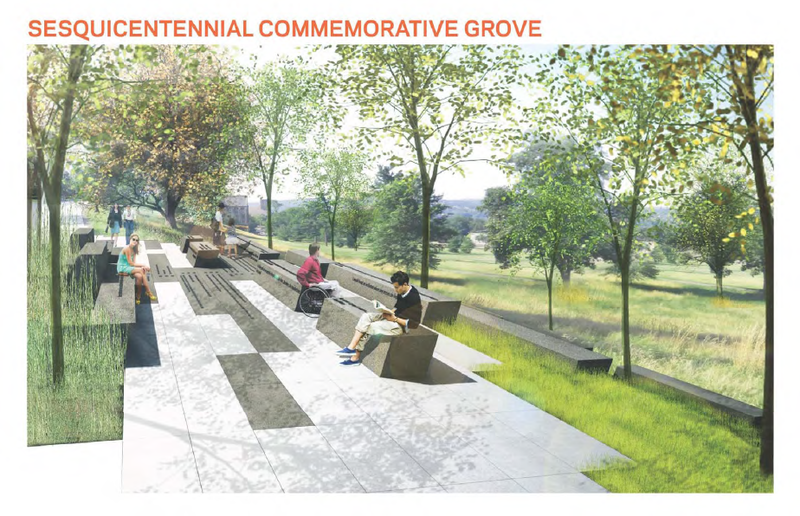 With the Neighborhood Pride site undergoing concept design and the recently-awarded grant money, that number will almost certainly be greater in these next five years. The story for BHTC has been quite the opposite. 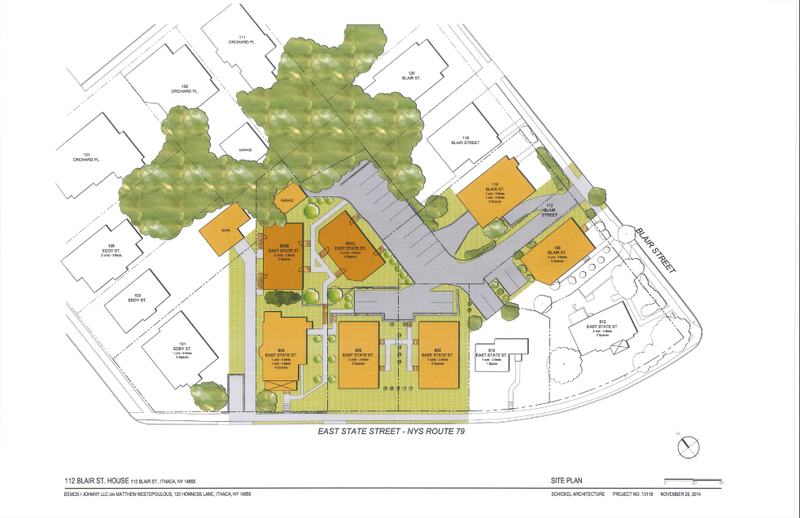 The 65-unit Lansing Reserve proposal failed due to neighbor opposition, and the 58-unit Cayuga Trails project for West Hill failed due to wetlands on site being greater than anticipated (and the neighborhood opposition didn’t help). BHTC has five older facilities in Trumansburg, Newfield and Slaterville Springs. 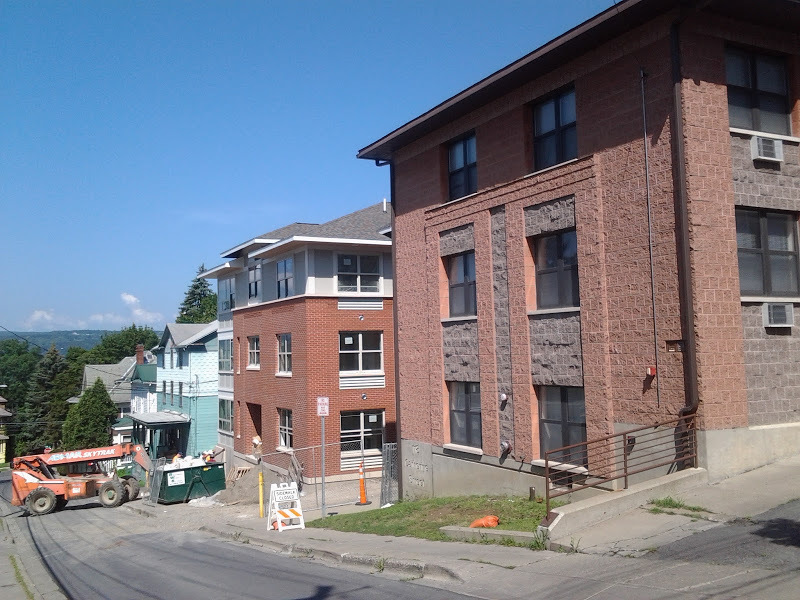 With any hope, the merged non-profit will qualify for larger grants, and BHTC can finally get some shovels in the ground in the hamlets and villages outside Ithaca. 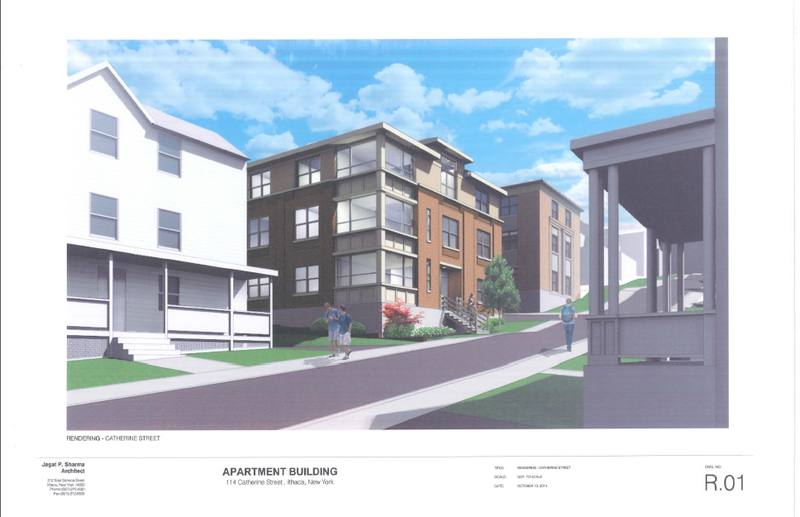 On a separate note, it looks like INHS did its annual website update, formally announcing plans for a single-family home at 304 Hector Street on West Hill. 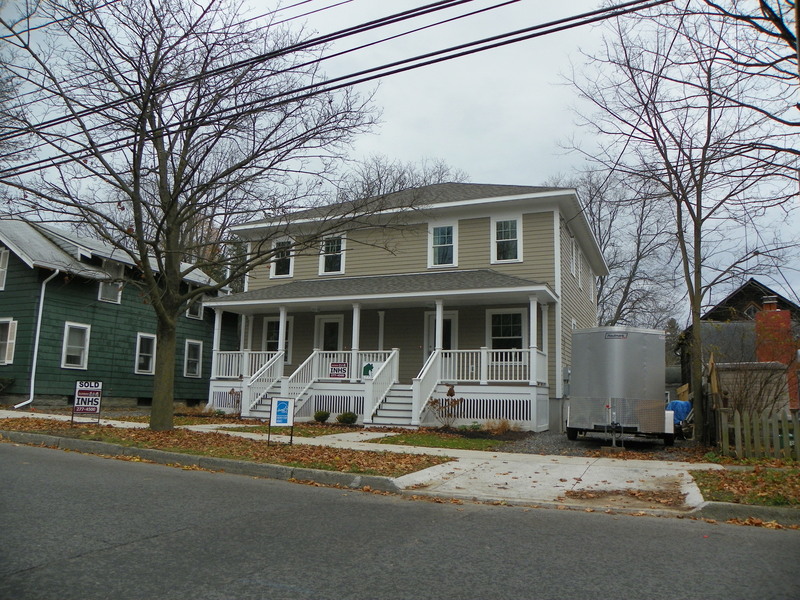 The lot was purchased in late October after a plan to buy and renovate a home in Northside fell through. 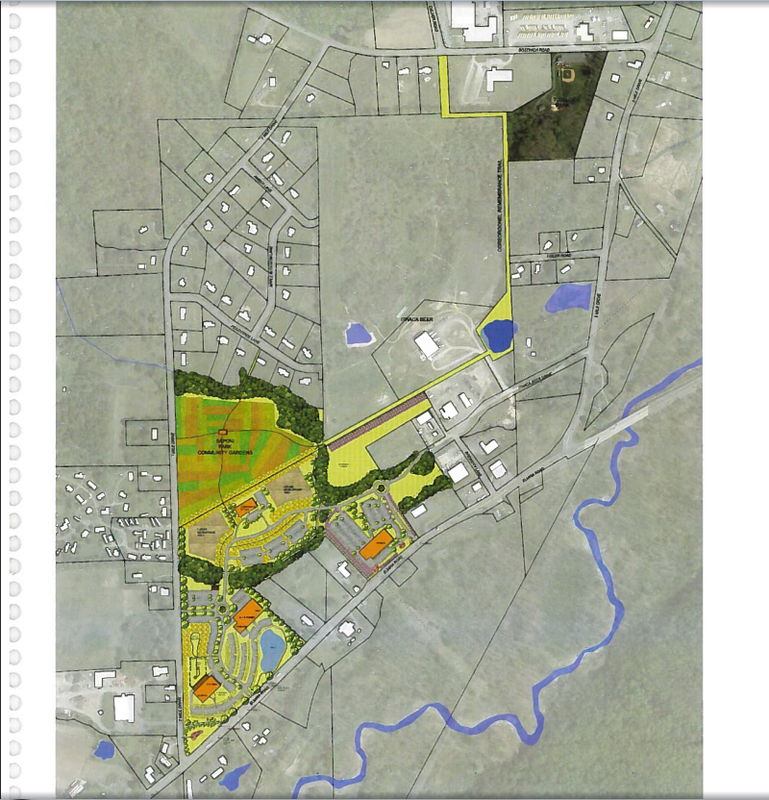 Stone Quarry will begin occupancy next September, and Greenways hopes to start in 2015. 2. 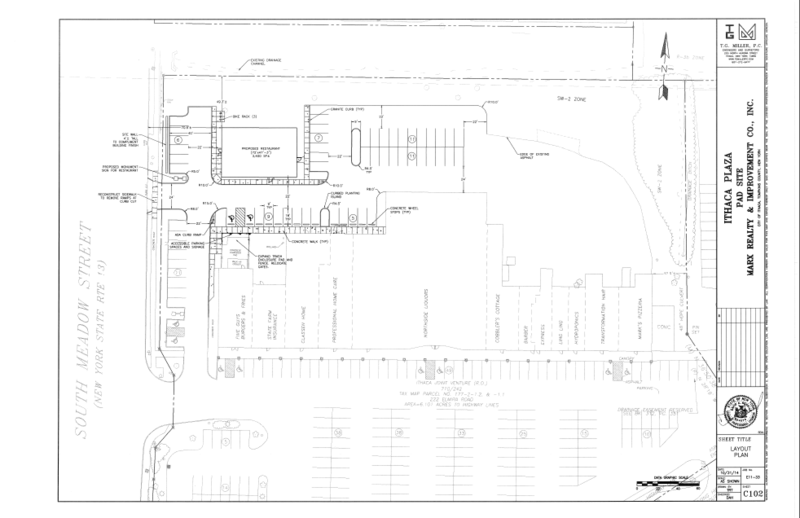 Here’s the site plan for 112 Blair Street. I’d include renders, if the sketch plan had any. 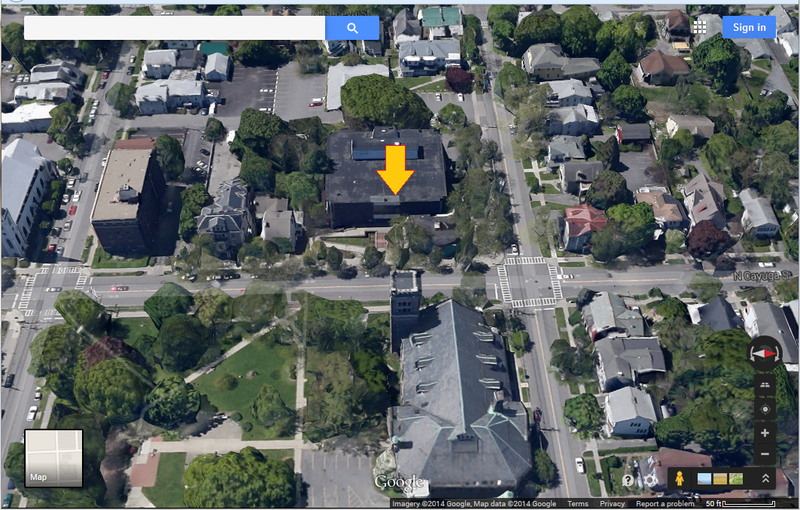 Two buildings with two units each and three bedrooms per unit -> 2 x 2 x 3 = 12 bedrooms. 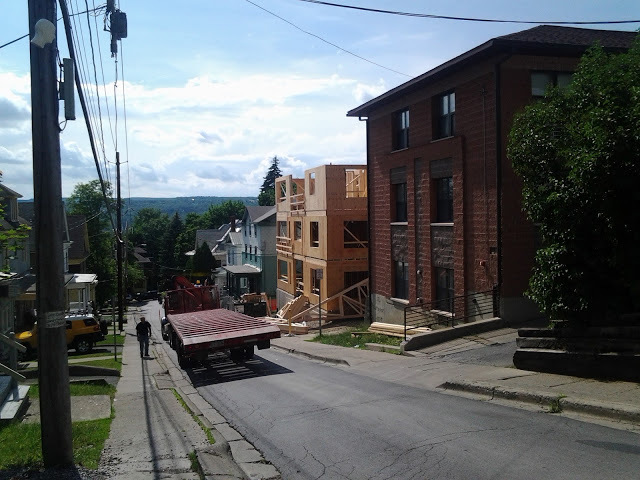 Nothing large, just an infill project tucked away from the street. 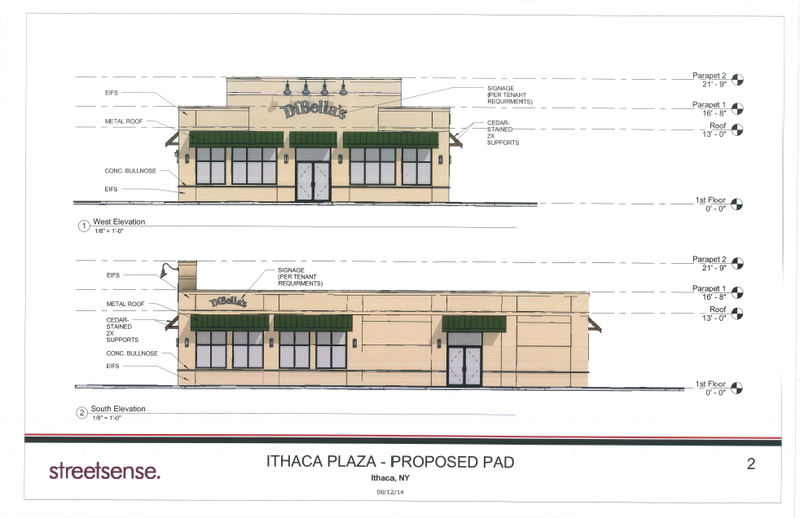 The design will be created by local firm Schickel Architecture, the same ones doing the Maguire project in Ithaca town. 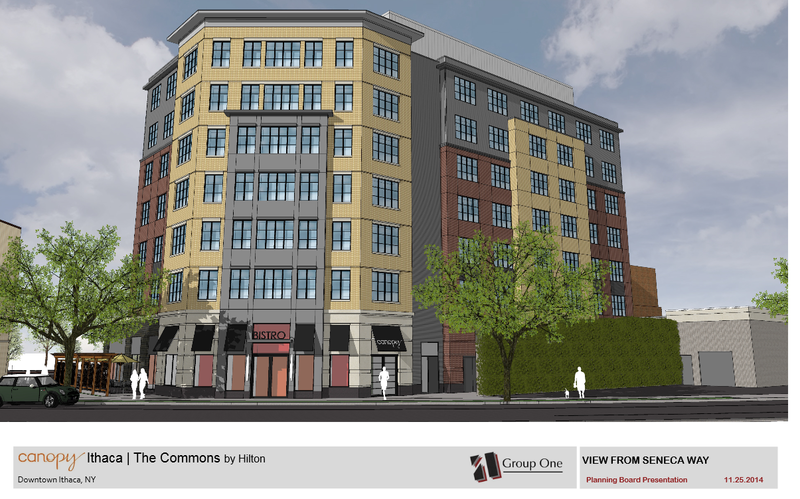 As noted by Planning Board member John Schroeder in a recent Sun article, projects like these won’t alleviate the housing crunch by themselves, but every little bit helps, and all the better if it recaptures living space from an underused parking lot. 3. Final design for the proposed Canopy Hotel? Possibly. In comparison to the last design, this latest incarnation adds more windows to the east face. I’m not going to lie, after six or so sets of designs (include three complete re-dos), I’m starting to lose track of the changes. 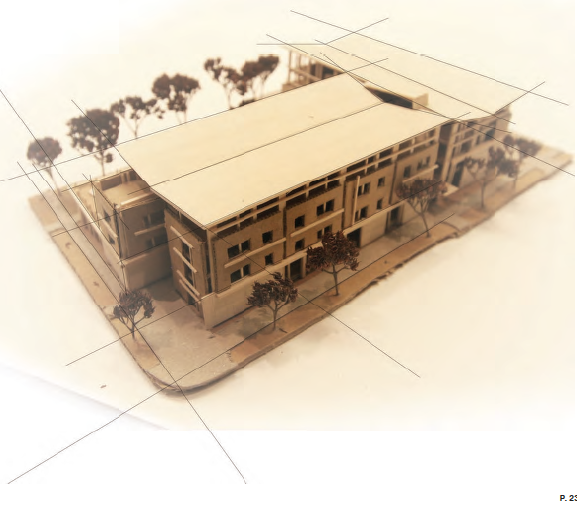 On the upside, the latest project plan from the city’s documents includes some neat context views, renders of what the building would look like from various vantage points in the city. 4. 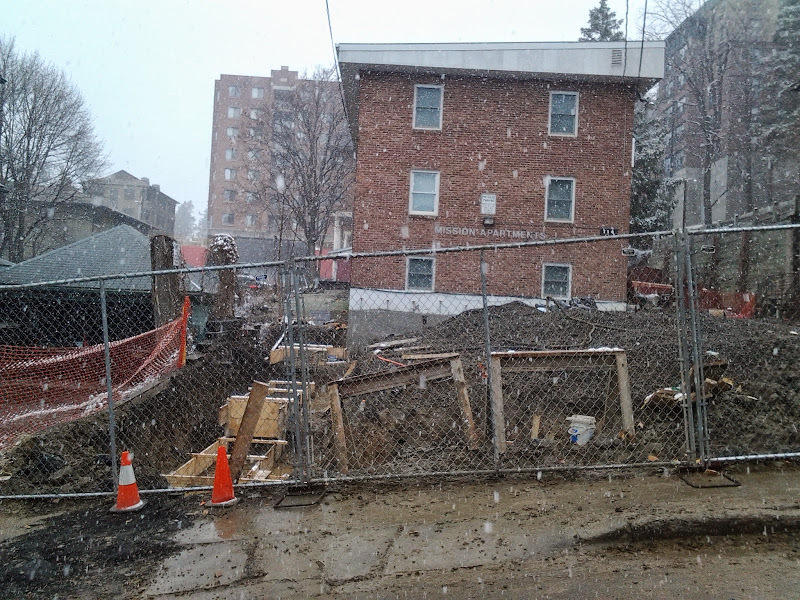 114 Catherine has been approved, its Spring construction date looks good to go. 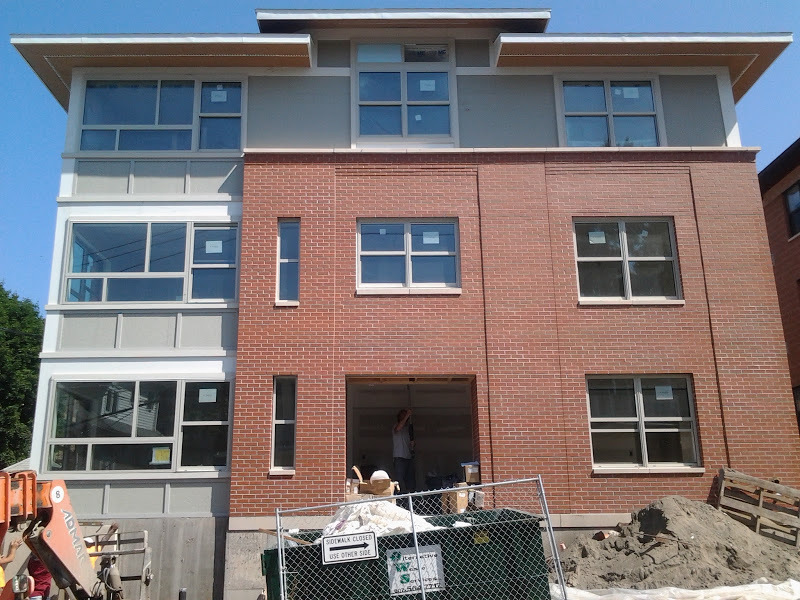 When completed in August 2015, 17 more bedrooms will enter the Collegetown market – a drop in the bucket, but a valuable drop nevertheless. 5. 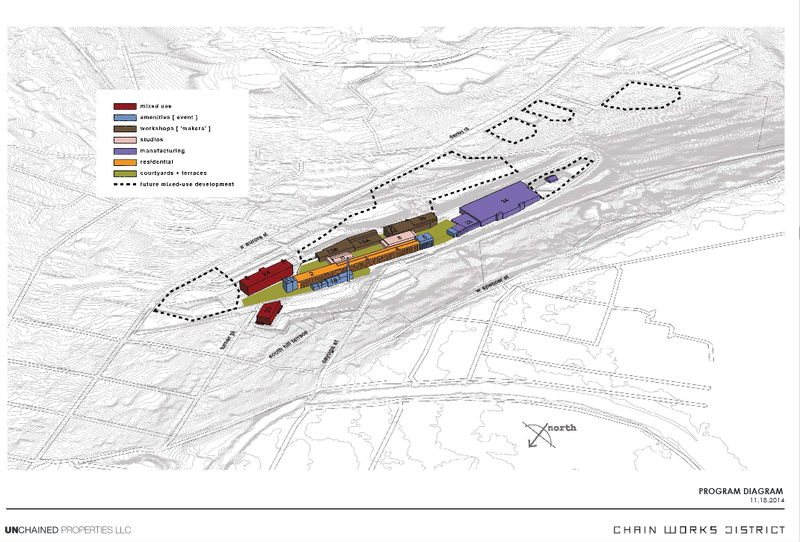 Towards South Hill, review of the draft generic environmental impact statement (DGEIS) continues for the massive Chain Works District proposal at the former Emerson Power/Morse Chain site. A scoping document of that DGEIS can be found here. In a nutshell, a DGEIS is part of the State Envrionmental Quality Review (SEQR), where the leading agency looks at a project, determines if any adverse project impacts are properly mitigated, and if so, issues a statement giving a negative declaration (approval). 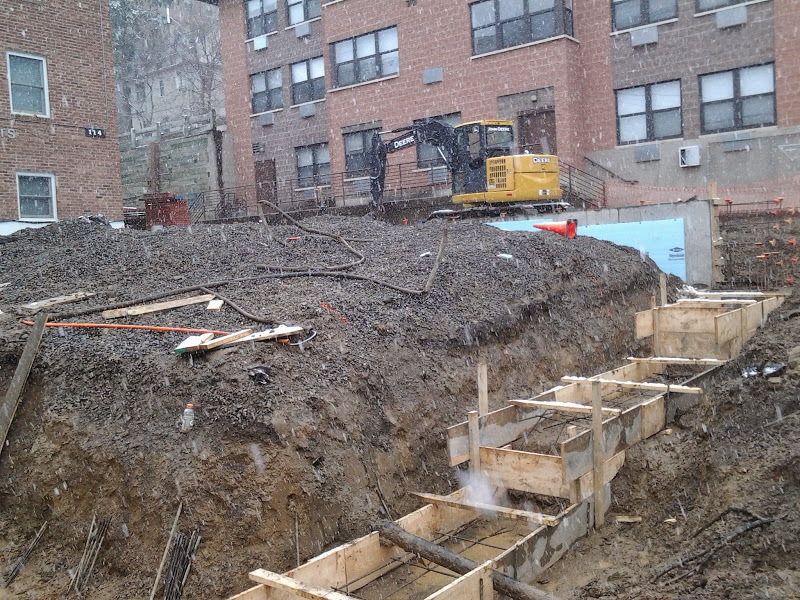 In this case, the NYS DEC also needs to be on board, approving the contaminated site for residential use. This is a pretty complicated project. There’s 800,000 sq ft of space to be removed or re-purposed, in an environmentally compromised site split between two political entities who are conducting joint meetings with their planning boards in an effort to try and move this project forward (the town of Ithaca board deferred to the city of Ithaca for lead agency; and both have been evaluating using their respective specialized mixed-use zones). 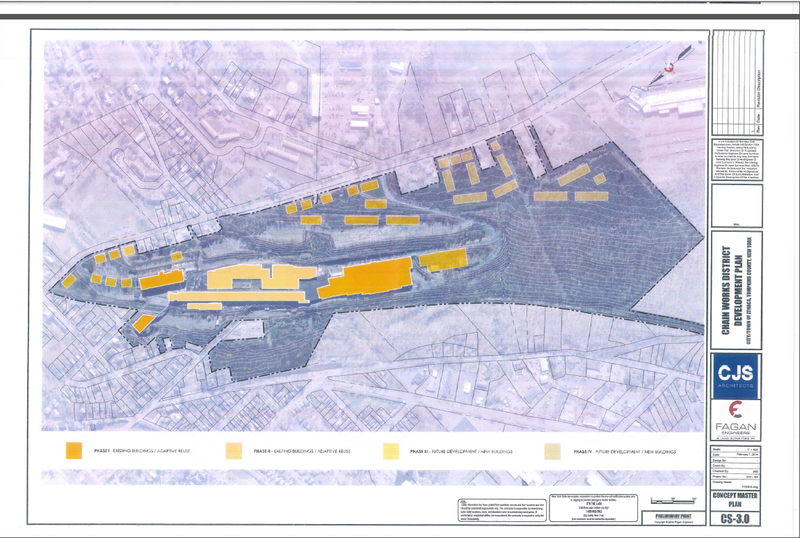 So far, there have been no nasty surprises on the polluted site. The site is mostly clean but still needed a little more for residential use, and Emerson will be flipping the bill for that. The comment period on the draft runs through the 10th, and the DGEIS will be finalized on the 16th. 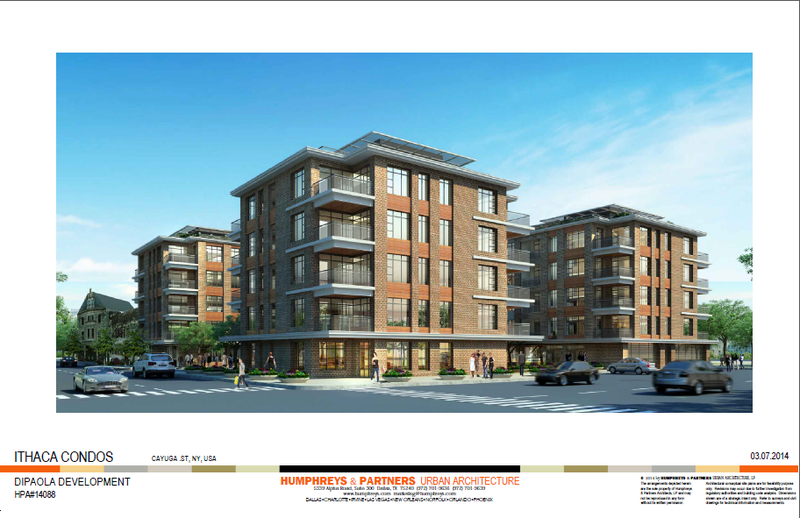 According to the project website, developer Unchained Properties LLC hopes to start Phase I, the renovation of four on-site buildings (21, 24, 33 and 34) into mixed-use and manufacturing space, during summer 2015. The mixed-use was initially proposed as office space only; but the developer behind the LLC (David Lubin) has struggled to fill the proposed office space in his Harold Square project, and seems to realize that having less office space would be a better plan for Chain Works as well. 6. The Cornell Daily Sun is reporting that the owner of CTB (Collegetown Bagels) is buying the Rulloff’s property and reopening the restaurant after it abruptly closed over the Labor Day weekend. The property was on the market for $395,000, and it’s fair to say the price was probably close to that figure. The murderous Edward Rulloff lives on.